Quest deep into the Circles of the Abyss! This quest pack introduces all new story lines, challenging adventures and exciting new miniatures to add to your Dungeon Saga collection. In the Eye of the Abyss story, command four new heroes that answer the call of the Green Lady in a quest to stem the insidious influence of the Father of Lies upon the world. He seeks an ancient, obsidian artifact called the Eye of the Abyss that has the power to sway whole kingdoms to the Abyssal Lord's bidding. Find the artefact and take it deep within the Abyss to destroy it where once it was forged. Control Artakl the Ghekkotah Clutch Warden, Eckter the Placoderm Defender, the Varangur Demon Hunter Magnilde and an esoteric Ophidian Academic; Jarvis the Human Necromancer as they fight in a precursor tale to the war for Mantica featured in the Kings of War Edge of the Abyss global campaign. 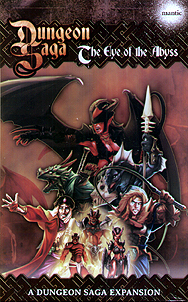 This adventure makes use of the minions, furniture and dungeon tiles already in your collection from the Dungeon Saga core game set and Infernal Crypts expansion. - Undead skeletons & zombies, fire-twisted abyssal warriors, vile molochs and more await you. An all new evil Boss for your Heroes to face, the Abyssal Temptress Mau'ti-bu-su is as malevolent as she is beautiful. Fear her looks and her malice, for she bears a weapon forged in the very fires of hell you must descend into. Not to be out done by new Heroes and always in need of a payday, the legendary adventurers Orlaf, Rordin, Madriga and Danor return for a string of adventures as they face life after Dolgarth. CAN YOU FOIL THE ABYSSAL SCHEME? These items are also compatible with the Adventurer's Companion for use in your own adventure.